The Avalon ice skating rink is a Rockefeller inspired ice rink at Avalon Mall in Alpharetta. The family friendly outdoor ice rink opens in mid-November and runs through mid-January. With shops and delicious Avalon restaurants all around it, it’s easy to make a day of it too. The Avalon ice skating rink is located in the Avalon Mall shopping district amid tons of twinkling lights. It reminds me a lot of the Atlantic Station ice skating rink with the beautiful Christmas tree and all the shops and restaurants, except Avalon Mall is about 30 minutes north of the city and doesn’t have the high-rise buildings surrounding the rink. I believe the fee include skates, but you may want to check before you go, as I have not been this season. What it does have are lots of shops, as well as restaurants. The rink itself sits in-front of the movie theatre. There are benches around one side of the rink if you want to watch, or there is a bar type set up behind the rink fence that is a perfect place to enjoy a hot coffee from Goldberg’s and watch the skaters. There is also a cushy couch in front of a warm fireplace off to the side. A perfect place to warm up and get into the holiday spirit while the kids skate. Here are seven other reasons I think Avalon Mall is one of the better places for ice skating in Atlanta. Zamboni ice repair: Ice in Georgia is a spotty thing, even during the holiday season. If it’s too warm, it doesn’t freeze well, and gets chopped up pretty easily. The Avalon ice skating rink has it’s own zamboni to smooth out the ice and they do it quite often. In the two hours we were there, they had the zamboni out twice. It’s always more fun to skate on smooth ice. Warm Bathrooms: This ice skating rink is very family friendly. There are nice, warm bathrooms around the corner, next to the movie theatre. Soft Playground: Next to the bathrooms is a soft play area for little ones who aren’t big enough to skate, or who have tired of the cold. There is an indoor area with garage doors that can open up to more climbing obstacles outside. The entire area is fence with only one way in or out. Free Parking: Parking is free in a deck on the side of the movie theatre. There is also valet right in front of the rink. Shopping: After taking some pictures and watching the boys, I slipped away for a few minutes to window shop the Avalon stores. I could have done some all out buying if I’d had more time. Be warned, there are also shops for the kids too. Fuzziwhig’s Candy Factory is right next to the rink. I left my son and two friends to look around while I went to get the car. In the less than five minutes it took me to walk to the car and drive back, they had spent over $20 on candy. I almost died. Although I have to admit, the looks on their faces when they ate the Cry Baby sour gum balls sprayed with War Heads sour juice was pretty funny. Avalon Restaurants: There are lots of different restaurants in Avalon for any taste at Avalon. Many are local chains with only two or three locations around the city, including some of my favorites from in-town like Antico Pizza and Bocado Burgers. I’m also curious about Bantam and Biddy. I really like their sister restaurant in Atlantic Station Chick-a-Biddy. Close Proximity to 400: We live in-town, so it’s a bit of a hike to Alpharetta. However, Avalon is conveniently located just off Georgia 400, so it’s easy to get there. 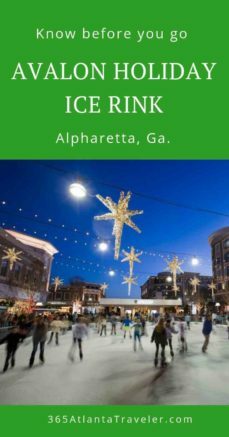 If you’d like to check out other places to go ice skating in Atlanta, we have a post that will give you the pros and cons of each place.